A major cause of peptic ulcer, although far less common than H.pylori or NSAIDS, is Zollinger-Ellison syndrome. 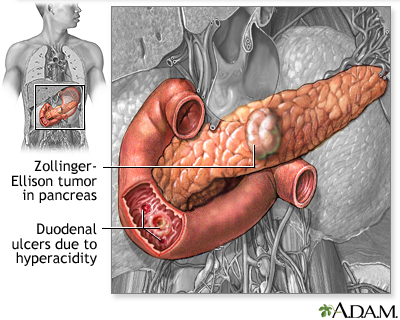 A large amount of excess acid is produced in response to the overproduction of the hormone gastrin, which in turn is caused by tumors on the pancreas or duodenum. These tumors are usually malignant, must be removed and acid production suppressed to relieve the recurrence of the ulcers.